Last night I played in my first Texas Hold ’em tournament: a quarterly event at a local bar whereby winners of the weekly games have the opportunity to compete for a cash prize in a 5 table tournament style event. I had been anticipating this game for at least a couple of months: so excited to have earned my stripes and the respect of my new poker peers and to be competing against some pretty respectable players. I rolled in ready to go and hoping to at least make the final table. But I was determined to at least have a good run. I went out in the first hand. My pocket cards: Ace and 8 – The Dead Man’s Hand. Well, technically the Dead Man’s hand in standard five-card poker is two aces and two eights – but the superstition translates to my hand in question as a pocket hand in Texas Hold ’em. And in all fairness (to defend my folly): at the river I had 3 Aces: a damn good hand to go all in with after being raised to 2/3rds of my chip stack. Unfortunately, my opponent also had an ace to match the two on the board – and a Jack to make the boat that he made on the flop. Aces and 8’s used to be my favorite hand. I would raise pre-flop whenever I had it and seemed to win with it most of the time. It became my favorite hand when I beat a friend of mine all in with it in my first home-game. But I should have known better. It is nicknamed for death. But from whence does this moniker come? Well, legend has it that it was the hand that Wild Bill Hickock was holding when he was shot to death by Jack McCall in Deadwood’s Saloon #10 on August 2, 1876. “The true, but infamous story, of the murder of Wild Bill Hickok by Jack McCall and the poker hand he was holding forever after to be known as the Dead Mans Hand. If you are a poker player worth your salt you most assuredly have heard of the Dead Mans Hand. The Dead Mans Hand, consisting of a pair of aces and a pair of eights, is known as the unluckiest hand you can hold. But, do you know why this poker hand is so infamous? 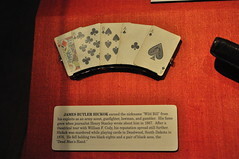 On the evening of August 1, 1876, James Butler (wild bill) Hickok was playing poker in a Dakota Territory saloon in the town of Deadwood with several other men, including a man by the name of Jack McCall. Jack had lost heavily that evening and was angry at his bad fortune at the table. Wild Bill, feeling a little sorry for McCall, generously gave him back enough money to buy something to eat, but advised him not to play again until he could cover the rest of his losses. The following afternoon when Wild Bill entered Nuttall & Mann’s Saloon he found another man sitting in his preferred seat. Wild bill, being a gambler, gunfighter and ex-lawman, had made many enemies along the way and always sat where he could see the room and the front door. After some hesitation, Wild Bill joined the game, reluctantly seating himself with his back to the door and the bar. Jack McCall, also known as Crooked Nose Jack, was already there and drinking heavily at the bar when he saw Hickok enter the saloon and take a seat at his regular table in the corner near the door. McCall slowly crept around to the corner of the saloon where Hickok was playing his game. McCall pulled a double-action .45 pistol from under his coat and shouted “Take that!” and shot Wild Bill Hickok in the back of the head, killing him instantly. Hickok, now slumped over the table with a bullet hole in the back of his head, had been holding a pair of eights, and a pair of Aces. The news and the manner of Hickoks death quickly spread and the poker hand he was holding has ever since been known as the “Dead Mans Hand“.